This week’s post chronicles an upcycling project that I hope inspires you to try some upcycling of your own, whether you follow along with the post and try to outfit an old bench with a new design, or pick an entirely new project. 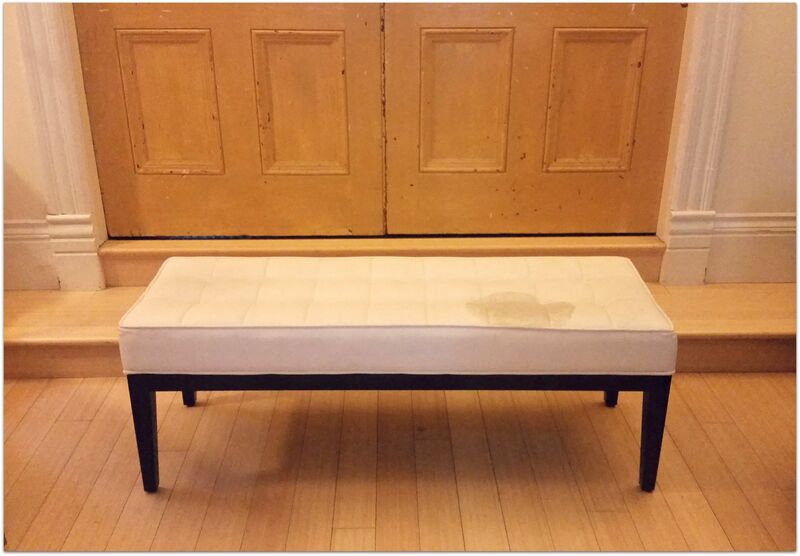 upholstered bench (the kind you’d put at the end of your bed) and the caption “Does anybody want this?” It was quite a nice looking bench, with a gleaming dark wood frame and a button-tufted white bonded- leather cushion. The cushion, however, had become her (super-cute, by the way) dog’s favourite thing to lick and chew on in recent months, and part of the bonded-leather had completely disintegrated. I had been enviously looking at pinterest images of bed-end upholstered benches for awhile prior to this, and so when I saw her post and the relatively great condition of the bench’s frame, I commented “I’ll take it!” right away. And so I became the proud owner of a to-be-upcycled bench that then sat in my storage for about 5 months (DIY projects tend to have a way of building up 😀 ). So a couple weeks ago I finally got around to the actual “Do It” part of my “Do It Yourself/DIY” project. 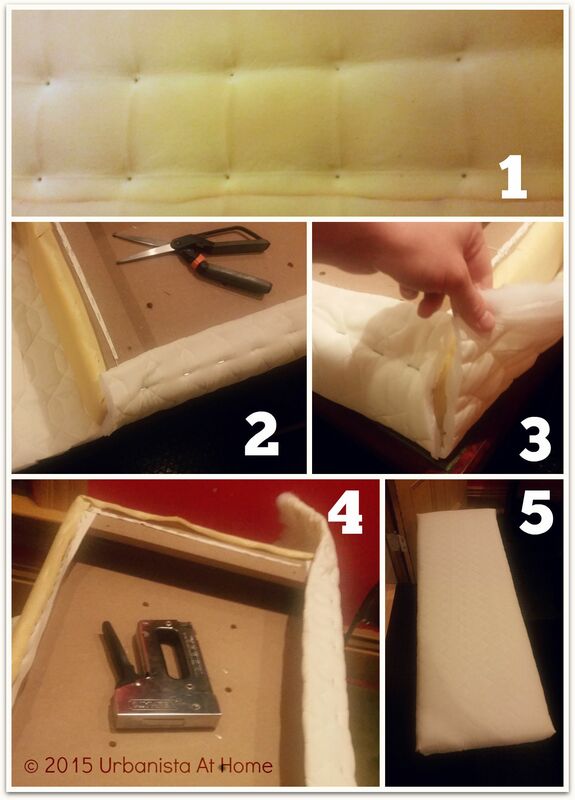 I’ve never upholstered anything before, but found an amazing blog post by Tara at Suburble that described upholstering an ottoman chair using a staple gun and a certain style of fabric folding that sounded pretty beginner-safe. I spent an hour wandering the aisles of my local fabric store, debating whether to play it safe with a nice grey, neutral canvas or take a risk with something with a bit more punch. A gorgeous navy and white printed canvas, which I can only describe as “Ink-blot/Navajo Pattern/Damask” inspired (truly! ), stole my heart and so I decided to take a walk on the wild-fabric side. I got just enough of it to cover the bench, but now that it’s all used up, I wish I had gotten more to make some co-ordinating throw pillows out of! (Take note, fellow DIY-ers: always ask for more fabric than you need when the fabric sales lady is waving her scissors about in front of you before she cuts it. You’ll always find something you can do with extra fabric, and you’ll always lament your poor decision to get less fabric when you realize you are 2 inches short of enough fabric to make your current project.) While you’re at the fabric store, pick up a few yards of quilt-batting or quilted fabric (usually 2 pieces of fabric with a sheet of cotton-batting sewn between them). You can use it to luxuriate your upcycled bench by adding an extra, cushy layer of comfy-ness beneath your patterned fabric – your tooshie will thank you! If you’re inspired and are interested in doing a similar upcycle of a bench, follow along with the image walkthrough of my project below! 1. 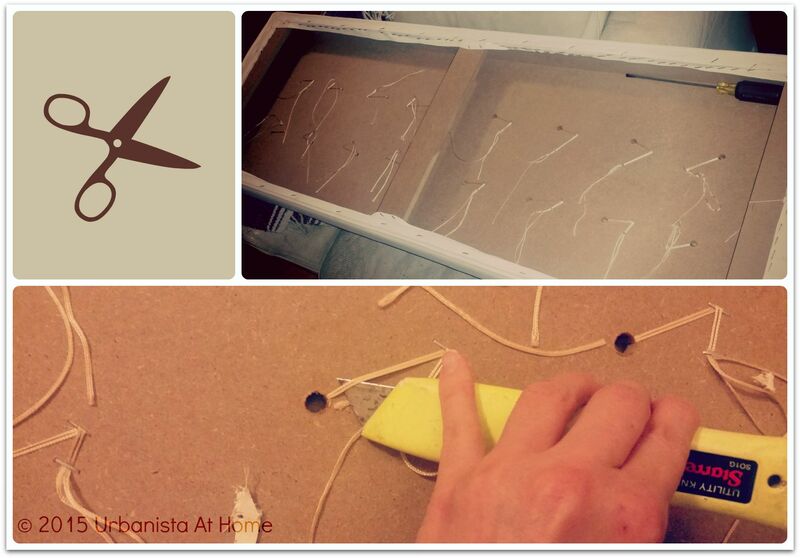 Disassemble the bench to separate the upholstered cushion from its frame. If you’re like me, you may find your cat trying to provide some “assistance” at this stage. Nothing draws a cat to a DIY project like a box-like contraption to sit in. 2. Prep and paint frame first, to allow enough time for the paint to dry, and to apply multiple coats if needed. I’m not the most experienced spray painter, so I did have to do a couple coats to make up for some rookie mistakes. I gave the frame a quick once-over with some sandpaper, and smoothed out a few dents in the wood before painting. 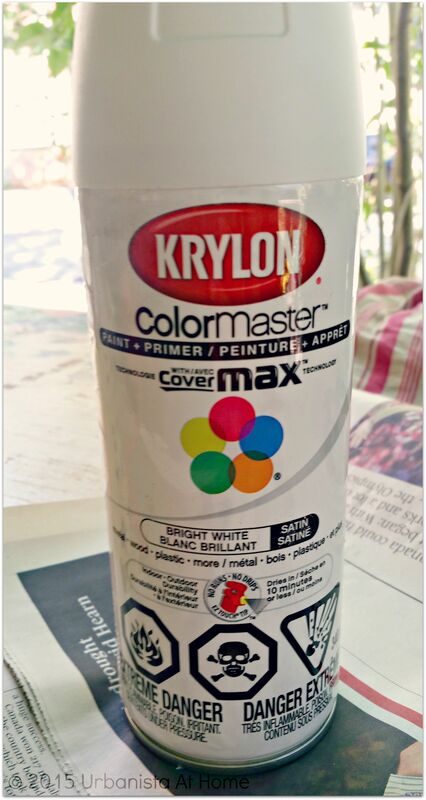 If you haven’t spray painted much before, I highly recommend checking out this post on spray painting tips from LiveLoveDIY – the pointers really helped me! 3. While the paint is drying, you can start disassembling the old upholstery on the bench cushion. It’s pretty amazing to open up a sleek piece of furniture and see all the work that somebody put into it when it was first made. Because this bench was tufted with buttons, it had tons of string ends and buttons to cut away in order to lift the fabric off the foam. Exacto knife to the rescue! Also try to remove as many of the old upholstery staples as possible – leaving them in and covering them up is tempting, but it could make it harder to put the new staples in. 4. Depending on your preference, covering the cushion in an extra layer of quilting may or may not be necessary. As you can see in image #1 above, because the cushion on this bench had buttoned-tufting in it, it left dents in the foam when I removed the old fabric. It didn’t look as smooth when the new fabric was placed on top, so I covered the foam cushion in a neutral quilted fabric (#2 & 3) and used the staple gun to adhere it to the cushion frame (#4). It made the whole cushion look a lot smoother and feel a lot cushier (#5). 5. Cut your patterned fabric to size, and put in a row of staples on one side of the bench. Once the staples are in place on one side, pull the fabric tightly across the cushion to pull it in place and staple on the other side. If your fabric is patterned like mine, you might want to double check that the pattern images are all in the right spots and are not crooked before you staple it down. For the ends of the bench, as mentioned earlier, I used the fold-over finishing technique used by Tara on her blog Surbuble – no sewing required! cushion is fabulously fabric’d, you can then reassemble the bench! 7. 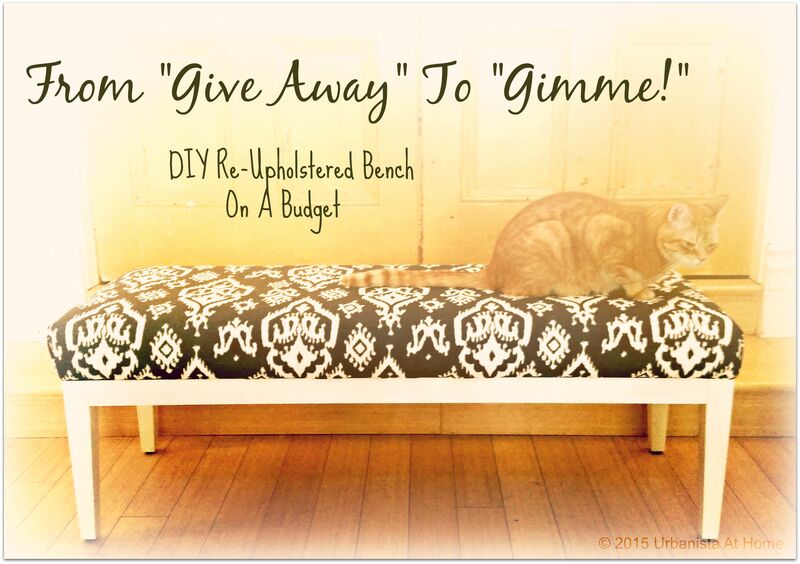 When the frame and cushion are securely refastened, you (and your cat, who has been patiently waiting for his “throne” to be finished) can take a seat on your new, one-of-a-kind upholstered bench!